The EHF leadership in Nyon to sign the ETS agreement. On December 8, 2009, at the UEFA headquarters in Nyon (Switzerland), EHF President Tor Lian and Secretary General Wiederer met with the leaders of the European team sports' federations to sign the European Team Sports' association agreement. The ETS agreement, between the six sports' federations, cements the long-standing cooperation and the committment to future collaboration on this professional level. The official statement has been reproduced below. The major European team sports today formed their own team – by creating an association to promote, develop and represent the interests of European team sport.The association will also further increase the information exchange that has taken place informally over recent years. “The European Team Sports express their satisfaction with the newly recognised status of sport in the Lisbon Treaty. As responsible, professional, democratic and representative European partners, the European Team Sports also express their desire to work in partnership together with their direct institutional counterparts, namely the European Parliament, the Council of the European Union and the European Commission, in order to shape a healthy future for European sport. Note to editors: The most popular European sports of basketball, handball, football, ice hockey, rugby and volleyball have been seeking for some time to further their common voice at European level – whether on EU matters or other issues.Basketball (FIBA Europe), Handball (EHF), Football (UEFA), Ice Hockey (IIHF) and Volleyball (CEV) have formed the association today and Rugby (FIRA-AER) will join as soon as the statutes are ratified by its relevant bodies. "This is a great day for European Handball. 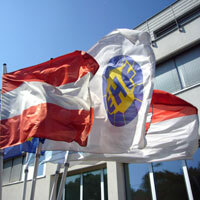 Approximately 10 years ago in 1999, the EHF initiated a platform for the team sports' federations. Now this ideas has been institutionalised in order to represent the common interests of sport," said EHF President Tor Lian.